Broadway, off-Broadway, and off-off-Broadway shows compete for the Drama Desk Awards and the 2015 winners were announced Sunday evening (May 31) at Town Hall. The astonishing Public Theater production of the Broadway-bound musical “Hamilton” won Outstanding Musical, plus six other awards. Lin-Manuel Miranda, the brains behind the musical, took home trophies for best Book, Music, and Lyrics. According to TheaerMania.com, it is the first time an off-Broadway production has bested Broadway competitors in the category since 1983, when “Little Shop of Horrors” nabbed the prize. The British import “The Curious Incident of the Dog in the Night-Time,” led the pack for top play honors. It won for Outstanding Play plus Outstanding Actor (Alex Sharp), Director (Marianne Elliott), Lighting Design (Paule Constable), Projection Design (Finn Ross), and Sound Design (Ian Dickinson). As of June 1, 2015: To watch the a repeat of the live stream, click here. Karey Kirkpatrick & Wayne Kirkpatrick, Something Rotten! Karey Kirkpatrick & John O’Farrell, Something Rotten! 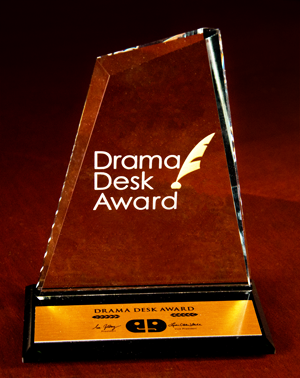 Special Awards: Each year, the Drama Desk votes special awards to recognize excellence and significant contributions to the theater. This year the nominators chose to bestow a special award for outstanding ensemble to the actors who so brilliantly shared a room in the world of A.R. Gurney’s The Wayside Motor Inn: Kelly AuCoin, Jon DeVries, Quincy Dunn-Baker, Rebecca Henderson, Marc Kudisch, Jenn Lyon, Lizbeth Mackay, David McElwee, Ismenia Mendes, and Will Pullen. To Bess Wohl, the Sam Norkin Off-Broadway Award: For establishing herself as an important voice in New York theater, and having a breakthrough year with the eclectic American Hero, Pretty Filthy, and Small Mouth Sounds. Her writing expresses sensitivity, compassion, and humor with a surehand. strated exceptional versatility in Tamburlaine the Great and The Iceman Cometh. To Ensemble Studio Theatre: For its unwavering commitment to producing new works by American playwrights since 1968, and enriching this season with productions of When January Feels Like Summer, Winners, and Five Times in One Night. EST’s Youngblood program fostered and nurtured Hand to God, setting Tyrone off on his devilish path to Broadway. To Andy Blankenbuehler: For his inspired and heart-stopping choreography in Hamilton, which is indispensible to the musical’s storytelling. His body of work is versatile, yet a dynamic and fluid style is consistently evident. When it’s time to “take his shot,” Blankenbuehler hits the bull’s-eye. Note: Eligibility and award category designations for the productions under consideration this season were determined by the Drama Desk Board of Directors. Because of the abundance of work throughout the season, the Board also authorized increasing the number of nominees allowed in select categories. Hand to God was considered in the 2011/2012 season in its first production at Ensemble Studio Theatre. New elements were considered in the MCC production in the 2013/2014 season. There were no new elements in the Broadway transfer. Fun Home was considered in its run at the Public Theatre in the 2013/2014 season. It received nominations for Outstanding Musical, Outstanding Featured Actress in a Musical, Outstanding Director of a Musical, Outstanding Music, Outstanding Lyrics, and Outstanding Book of a Musical. Disgraced was considered in its off-Broadway premiere at Lincoln Center in the 2012/2013 season, and only new actors and technical staff were eligible in the Broadway transfer. The 39 Steps was considered in its initial Broadway production in the 2007/2008 season and won for Unique Theatrical Experience.